GMAC Bowl - One of the college football bowl games with a large local following. 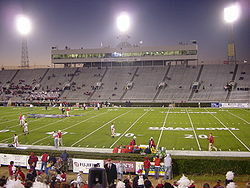 The 2010 GMAC Bowl game (which is part of the 2009 college football bowl game post-season) will take place on January 6, 2010 at the Ladd Peebles Stadium in Mobile, Alabama and will be the 11th edition of the game. The Bowl originally began in 1999 as the Mobile Alabama Bowl (1999 - 2000) and it is held annually in January - usually as one of the last college bowl games that are not part of the BCS Bowl series. The Bowl featured a MAC (Mid-American Conference) or WAC (Western Athletic Conference) team against a representative from the Conference USA until 2009. Then the Bowl announced a new agreement to annually feature teams from the ACC (Atlantic Coast Conference) and the MAC instead - beginning with the 2010 game. Since the beginning the event has had a very strong following from the local community in Mobile. In 2001 the game took on the match-up of the MAC vs. Conference USA and the MAC has gone 5-1 head-to-head with their C-USA rivals. The 2009-2010 Bowl game will feature the (Champions of the Sun Belt Conference) Troy Trojans, representing Troy University in Alabama vs. the Central Michigan Chippewas, representing Central Michigan University, Mount Pleasant, MI in the MAC. From early 2011 on (still part of the 2010 college bowl football season), the bowl is renamed after the new sponsor Godaddy.com - and you guessed right - the name is: GoDaddy Bowl. For both teams it is the first appearance in this bowl game and their first time playing each other. It will also be the only 'non-BCS' game where two conference champions are being matched-up. GMAC Financial Services became the title sponsor starting with the 2001 edition of the game. GMAC Financial Services is known for its suite of financial programs including insurance and mortgages. The Bowl has been played at Ladd-Peebles Stadium (formerly known as Ernest F. Ladd Memorial Stadium) on Field Turf (2004 - present) and grass (before 2004) since its inception. The stadium, opened way back in 1948, holds over 40,000 football fans (about 50,000 for concerts) is (primarily) the home to the NCAA University of South Alabama team and the host to the Senior Bowl. Buy your GMAC Bowl Tickets now before it is too late and be one of the tens of thousands enthusiastic fans in this great stadium. Right after its name change in 2001 the bowl game between the Marshall Thundering Herd and East Carolina Pirates set the record as the highest scoring bowl game of all time. Marshall had the greatest scoring comeback in Bowl history.They came recovered from a 38–8 deficit to win the game 64–61 in double overtime.